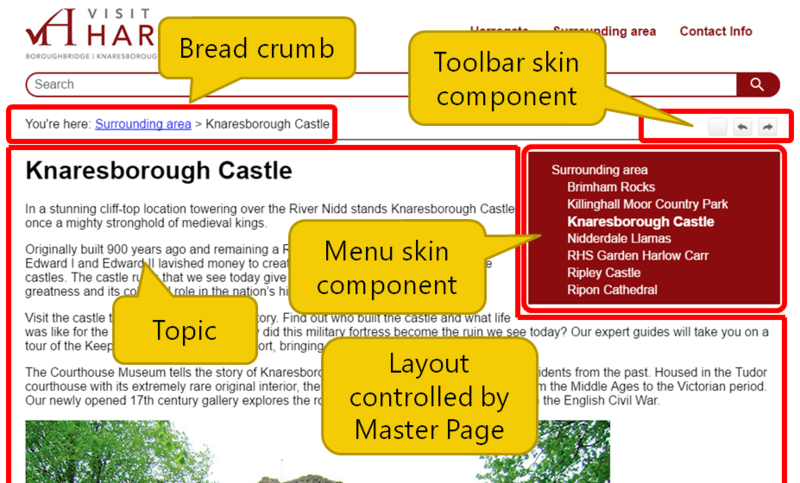 Article by Matthew Ellison of UA Europe providing tips on how to fine-tune the layout of your HTML TopNav output. Published in ISTC Communicator, Autumn 2017. One of Flare's most popular and innovative features is its TopNav HTML5 output format. This enables you to create user assistance that has the same layout and navigational features of a modern website. Configuring the layout to suit your precise needs and to match your own in-house style is, however, not a trivial task. In addition to editing the main skin file, you must also set up a suitable master page, and configure a number of other skin components. This article provides some tips, based on my own experience, on setting up these additional requirements. 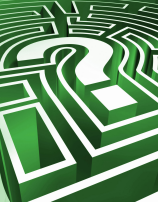 When the user looks at a page within the TopNav output, they typically see not just the content of the topic, but also a number of other navigational components wrapped around it. The most obvious of these is the main skin, which is always displayed at the top, and contains a logo, a horizontally arranged set of menus, and a search bar. Beneath this there is often a side menu (containing links to related topics), a topic toolbar, and a bread crumb, in addition to the topic content. It is the job of the master page to arrange these items in the required layout beneath the main skin. You can configure the format and presentation of the side menu by adding a menu skin component to your project, and then customising it using the Menu Skin Editor. This enables you, for example, to change the background colour of the menu, and the font colour of each of the items. You can also increase the space between the items by incrementing the margin-top setting of the menu items. An equally important setting is the width of the menu, which I normally set to 100%. This causes the side menu to fill the available space allocated to it within the master page, and means that its right-hand edge is correctly aligned with the topic content. Finally, I like my side menu to be hidden automatically on mobile phone screens, and you can achieve this by setting the menu's display property to none for the Mobile Medium. To control the buttons that are displayed on the topic toolbar, you must add a topic toolbar skin component to your project, and then customise it using the Topic Toolbar Skin Editor. Using this editor, you can select the standard buttons that you would like to be included on the toolbar, and you can even add your own new custom button by clicking the New Style button. This will require you to specify the appearance and action of the new button using the Styles tab. Given that the topic toolbar is normally displayed to the right of the topic content, it looks best if the buttons are right-aligned on the toolbar so that the right-most button is correctly aligned with the topic content. 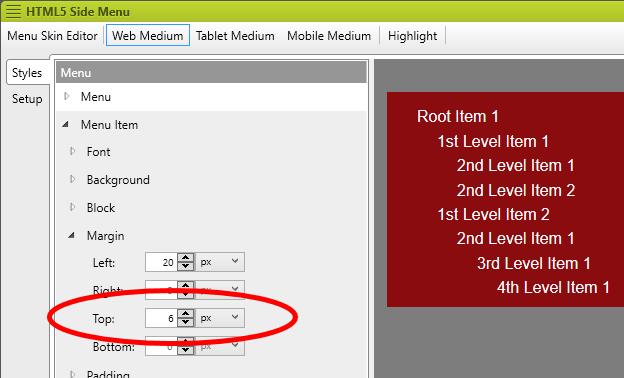 Using the Styles tab, you can achieve this by setting the Toolbar > Alignment > Horizontal property to right. In the 2017 r2 release of Flare, MadCap added some useful new options that affect the way that the skin is displayed. In my opinion, the most useful of these is the Fixed Header option, which ensures that the topic header does not move out of view as the user scrolls down through a topic. This means that the top navigation menus and search bar are always available. 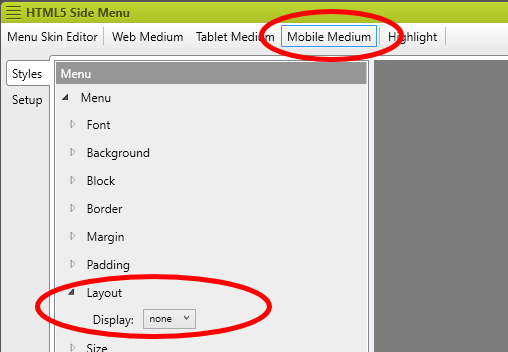 This option is on the Setup tab of the Topnav HTML5 Skin Editor, and can be turned on for specific mediums, or for all. I also like the option to show the slide-out table of contents as an expanding and collapsing Tree, rather than the Drilldown presentation that was always used in previous versions of the Topnav skin.